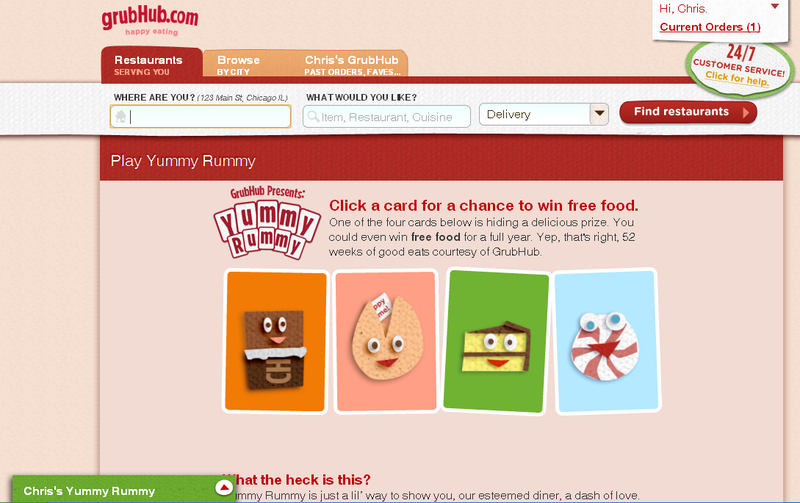 As a minor addict of the food delivery website GrubHub, I’ve been awaiting the day they served up a rewards program. Today, as I went to order, I noticed an update to the site to include this thing called ‘Yummy Rummy’. After 3 orders, you get a ‘play’ at the game, and you can win credits off future orders, food items, and even free food for a year. It’s an interesting twist on a standard points-based loyalty program. -It’s based on orders, not dollars spent. -This will likely be less costly to them than a passive rewards system, as you have to play the game and use the credits. -Instead of food prizes, I prefer straight cash, homey. It’s a good step for my favorite Chicago-based web start-up. Eat up. For many, large portions of Walter Isaacson’s biography of Steve Jobs will be retreads of now apocryphal tales. In other portions, the direct narrative from Jobs and his closest cohorts proves an interesting glimpse into the man who was more a singular force of will than anything else. He cursed employee’s best efforts, and deceived his closest friends. He had few hobbies, no time for philanthropy, little time for personal relationships, and a moral code that could best be defined as opportunistic. But we will forgive these things, because he helped create a company that churned out products that enlightened design, raised standards, and will ultimately define a generation. Society would be less forgiving of Jobs’s character had his drive created an oil products or pharmaceutical empire. The surly, dynastic traits exhibited Jobs are no different than the likes of Rockefeller, Morgan, and Carnegie. Jobs’s closed systems happened to create products consumers love. The others noted here will be viewed without any romance. In some regards, they are held up as all that is wrong with capitalism. The domineering and controlling tendencies amongst moguls spans industries. Let’s cut the others the same slack (or condemn them equally). The struggles of the US Postal Service have been well documented. The looming bankruptcy is exposing the weaknesses of the union contracts and lack of competitive focus. Responding to the pressure, the USPS is raising the price of standard postage to $0.45. This is a small step in the right direction, but it’s not nearly enough to fill the $8.5 billion hole. If the USPS wanted to accurately price the service and drive more volume, they should adapt a bar code / account system for retail users. Instead of, or in addition to, selling fixed-price stamps, they should offer users the ability to create an account online, register a credit card (or bank account, PayPal, whatever), and order custom coded stamps. These stamps would be read by machine, and the USPS would charge back to the account a variable price based on location and weight. If someone is shipping a letter from New York to Casper, Wyoming, the cost (and the price) should be higher than a person shipping a letter down the street. If someone put a stamp on a package, they would apply extra cost for the weight and volume. This system would be flexible enough to apply those costs without making the process cumbersome to the user. The USPS website would have a rate calculator to approximate the cost if anyone really cared to determine the difference between a $0.50 letter and a $0.61 letter. These tools are available today for larger businesses, but they should be driven down to the consumer for letters and other small parcel, non-urgent postage. I posted this speech a bit ago, and it’s worthy of a re-watch today.